in esoteric philosophy, the receptive, passive, and the negative aspect of the cosmos. Matter, form, and wisdom are usually considered feminine and are represented by goddesses in the pantheon of multiple god religions. me too, which is why I do not believe in multiple god religions. a term used to describe the beat generation and then again, the hippies. I don't know who started the myth that hippies were dirty. After all, hippies made hot tubs popular and introduced co-ed showering to the general public. True hippies were no less hygenic than any other segment of the population; at times, the facilities weren't available. But whenever a hppie settled down somewhere, bathing accomodations were some of the first amneities required after cooking and sleeping. After all, hippies were very decadent, and what is more decadent than a luscious bath? A director I once worked for called Hot Tubs "old man soup"
March 20,2007 "Bomb them back into the Stone Age"
a threat made in 1965 by member of the U.S. Joint Chief of Staff Curtis lemay (1960-1990), in reference to the North Vietnamese. I love the stupidity of that statement. It refelects the old school belief that we could identify and defeat our enemy. If you think about it, Vietnam was the beginning of a terrorist movement; you could not identify your enemy. It took a long time before the military minds adjusted (or may not have yet) to the idea that our enemy was identifiable to our troops. Dutch, Gen. LeMay was definitely old school. He was the chief architect of the WWII strategy of bombing Japan into submission. Before the famous nuclear weapons that did the trick were ready, this involved massive firebombing raids by our B-29s. Given the suicidal self-defense virtually the entire Japanese populace was trained to inflict on an invading army, this characterization of them all as combatants is almost legit. (Of course there are innocents like children, and it's not legit in other big ways. But it was technically legitimate enough to allow this bombing.) It would be much harder to justify characterizing the Vietnamese people in such a way. Other: LeMay headed the air operations of the Berlin Airlift. 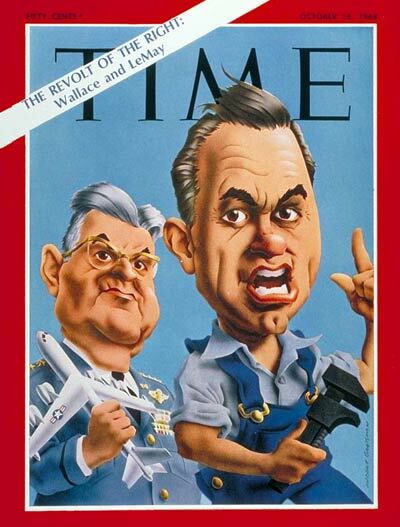 LeMay was George Wallace's running mate in the 1968 presidential election. I don't remember the "Stoned Age". A term of approval. This word eveolved during the beat and hipie eras from a purely inamimate physical definition to a term describing human emotions. As a beatnik term, it was often a conversation filler. Example: "Sold man, lets play bongos". In the hippie era, it moved on to describe more of a literal appreciation of skill. Example: "he's a solid bongo player"
Again, the examples kille me. Haaa --even as a kid during the hippie era, Dutch, I knew that bongos were out, a relic of the beatnik and folk eras. Yeah, the first black kid I was friends with was Link, too! His name was actually Leroy, and he and I and this girl I liked would always talk in the hall before my drafting class. We styled ourselves the Mod Squad, with me being Pete, of course, him as Link, and Debbie as Julie. That's what we called each other all the time, anyway. This was in 7th grade, and I think Leroy-Link was in that drafting class with me--we didn't have a single African American in my whole K-6 grade school! Debbie-Julie might have been in an English class across the hall or something. And none of us three looked like our Mod Squad counterpart, but it worked. Speaking of Julie, actress Peggy Lipton was married to Quincy Jones for a while. I just found out (by watching Letterman) that the actress who plays Karen on The Office is their daughter Rashida Jones. Solid! Knowing this background now, it makes something I saw on The Office a couple weeks ago all the more funny and outrageous. The Stamford, CT, office branch was merged into the Scranton, PA, office, so Karen (Rashida), Jim, and these others were greeted by Michael as they'd come in for their first day at Scranton. Michael is like, "You must be Karen Filipelli. You look very . . . exotic. Was your father a G.I.?" are not on the beam. Fry me mama with a can of Lard"
Yeah, Dutch, sorry to say, but Ayla's definition puts solid back into the swing era, which would be the '30s-'40s, whereas the hippie calendar puts our type of meaning only into the '50s. I think I trust Ayla's source more than these hippies and their crazy bongos and congos! Think of the term solid citizen. That can't be a hippie term--that's the sort of thing, like square meal, that my dad might say! Here solid is not just a default term of praise, but it does have a specific connotation paired with citizen. So, it's not a physical solid, and in fact, it might even be a source for applying solid to any personal or emotional or musical characteristic that's particularly robust and full and steady. There are books that would answer this. In fact, there's probably a webpage somewhere that does. But I've enjoyed speculating too much to actually look it up and perhaps have to erase my speculations in favor of facts! "Do me a solid, man." When did people start saying that? to solicit a ride in a car from a previously unknown person by standing along a street or road with a thumb extended in supplication. These examples are not done by hippies. I think the Hippie calander is solid! Claudette Colbert and Clark Gable both won Oscars for It Happened One Night (1934), which itself was Best Picture (and Frank Capra won Best Director--making a rare Oscar grand slam). I use to hitchhike in the day. Late 70s early 80s. Never a problem. Use to get me every where. I still pick up hitchhikers on occassion. Never with my family in the car. Lots of times they are homeless. If I have few bucks in my pocket I will give it to them. The one and only time I hitchiked was when I was in the Navy back in '69. A couple of clowns that I was sationed with in Newport said they would give me ride to NY for a weekend home. Sadly, their idea of NY was the Nj Turnpike in the Meadowlands, where they pulled over and told me to get out or ride to Delaware with them. A trooper picked me up in short order and very nicely dropped me off near the Lincoln Tunnel. So, I walked up the ramp, stuck out my thumb and I guess cause I had my uniform on, the first car stopped, picked me up and dropped me a few miles from home. any man who relies on masculine posturing for his personality. an overly patriotic man. And whats wrong with being overly patriotic? Jeeeez. The Electric Kool-Aid Acid test is a 1968 book about ken Kesey and the Merry Pranksters, written bu Tom Wolfe. It deals with the consumption of LSD and other craziness of the times. Psychedelics were often consumed in food or drink, and Kool-Aid was ofetn mentioned in truth and fable as an amusing recptacle for LSD. Mu only expereience with Electric Kool-Aid came to me at a Carol King free concert in Central Park in the summer of 1972 (Carol King and Acid??). I was sitting listening, because you couldn't see and some guy comes up with a jug and offers it to everyone in my group saying, "just fill one cheek, no more than that" I'll pass, but my buddy didn't and when I left him later that night he was still on a roller coaster ride.